Eighth grade chemistry teacher Patty Korman began a recent class at Bunn Middle School with a simple exercise to get her students warmed up. “On your desks I’ve left a card for you. Imagine that this card is worth $500. Write down on the card what you would do with this amount of money,” Korman said. 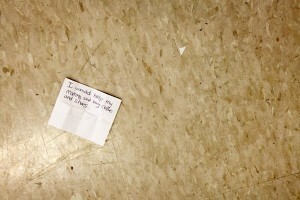 A student leaves behind a card describing what he or she would do with extra money. Photo by Ricky Leung / NC Policy Watch. Some students shouted answers, others dutifully scribbled on the cards. 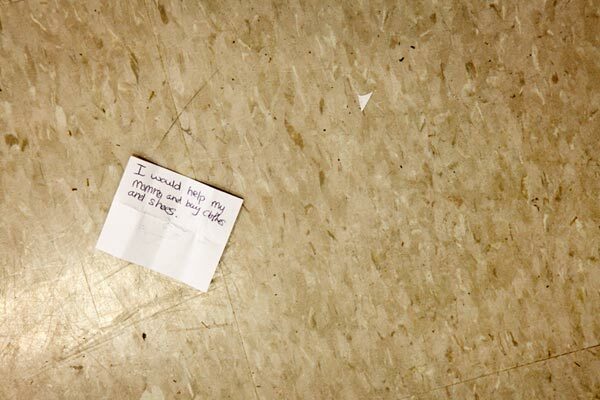 Korman had used this exercise in a previous class period; one student’s card lay discarded on the floor, face-up, at the back of the classroom. The students at Bunn Middle School come from homes that are struggling for the basics. Their school is no different—in a scenario that has played out across the state, Bunn has lost its remediation program, struggles to provide an adequate supply of computers, cannot offer enough courses to fill up a school day and even lacks a basic supply closet. Bunn Middle School is located just 45 minutes east of Raleigh in rural Franklin County. The school has just over 700 sixth-, seventh- and eighth-grade students, 61 percent of whom are eligible for free or reduced lunch—a figure significantly higher than the state average of 34 percent. Remediation funds are one casualty of the budget cuts that have hit North Carolina’s public schools. State funds for education have been cut to the tune of $690 million between FY2009 and FY2012, while student enrollment has grown by 16,000 students. North Carolina has slipped to 46th in the nation in per pupil spending, according to a recent report by the National Education Association. 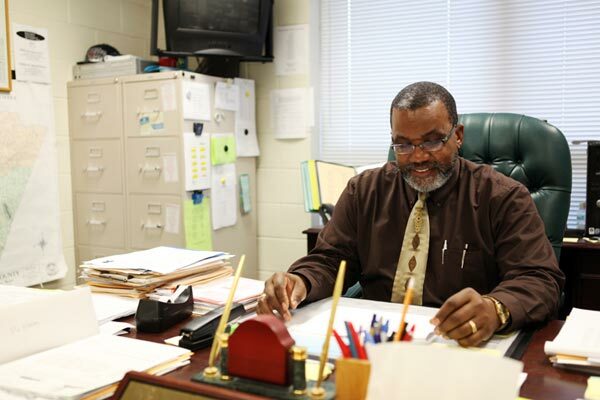 Principal Roosevelt Alston came to Bunn five years ago, intent on transforming Bunn into a “school of distinction.” To achieve this status, Alston had to catch students falling through the cracks. Five years ago he had a strong remediation program in place and was able to identify struggling kids early on in the school year, hire teachers to stay after school to remediate them and even hire drivers to get kids home on activity buses after they got the extra help. He also had a full summer-school program, complete with breakfast, lunch and buses. In just five years, Bunn’s performance composite, which is based on students’ end-of-grade (EOG) test scores, increased from the low 60th percentile up to 81 percent. Bunn Middle School Principal Roosevelt Alston. Bunn’s remediation program, which Alston credits with saving his school, was slowly whittled away by state budget cuts. As funds for remediation dried up, the school moved to what was called an “in-house remediation program” that took place at the end of the school year. If students failed their EOGs the first time, they were remediated for just one week by teachers while students who passed their EOGs were kept busy with extra assignments. Students would then retake the EOGs after the one-week remediation program. Today, there is no remediation program at all—and no more summer school. Students who need extra help must rely on the good will of teachers, who are not compensated for any extra time they can devote to students, if they are able to devote any time at all. End-of-grade tests are now only given once, and promotion waivers are sought for students who do not pass. 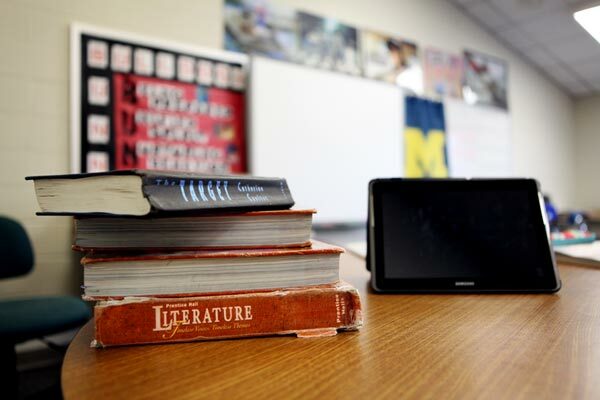 Old textbooks sit next to a digital tablet in teacher Charles Elliot’s language arts classroom. The biggest change Alston has seen at Bunn during the past five years has been the shift from traditional learning environments toward technology and online testing. The changes have created a chasm between those who have the means to access the technology and those who do not. “Technology, technology, technology. It started off slow, because each year funding had been decreasing. Then all of a sudden, there was a big push to get smart boards in all of our classrooms. We had to piecemeal that,” Alston explained, with funds from the Race to the Top program, a three-year grant from the U.S. Department of Education designed to incentivize states to implement education reforms. The program is intended to spur innovation, but states are expected to sustain reforms and their associated costs over the long term. North Carolina also signed on to the Common Core State Standards initiative, which is intended to provide a clear and consistent framework for what students are expected to learn and emphasizes technology and collaboration. Common Core encourages teachers to employ a flipped classroom model, which moves away from teacher-as–lecturer and toward a learning environment in which students primarily work together during class to achieve learning outcomes. In preparation for class, teachers typically post reading materials or record short lectures that students are expected to read and listen to beforehand by logging on to a website at home. The problem with this arrangement, says chemistry teacher Korman, is that her students don’t always have access to the Internet. One workaround for this access problem could include providing students access to computers before or after school. However, Alston explained, with 700 kids and 3 computer labs with just 89 computers, the labs are essentially booked around the year for online testing, which is now the expectation for all end-of-grade (EOG) tests and year-round benchmark testing. “And two of our three labs are supposed to be vocational education labs. They are teaching labs. So we are displacing those students for testing as well,” Alston said. Money and space for more computers is not on the horizon. In 2010, the statewide textbook budget dropped from the previous year’s $116 million to just $2.6 million. There’s been a slight increase since then, but not nearly enough for new textbooks. “A few years ago when it was math book adoption time, my textbook allotment was not enough for new books. I was $30,000 short,” said Alston. 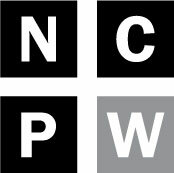 “So we took some of the textbooks that were still good and rebound them for $5-8 a piece.” Since then they’ve relied more on online resources—either from the NC Department of Public Instruction’s website or elsewhere on the Web—in the form of lesson plans, handouts and other digital resources. CD-ROMs of textbooks are another resource, “but you do still have that component of your student population that does not have that kind of technology at home,” noted Vice Principal Jonathan Dixon. Myra Bridgers, an eighth grade language arts teacher, has been teaching for 19 years in Franklin County schools and can say definitively that the past five years have been the worst she’s seen in terms of budget cuts. Gazing into a restless crowd of students in the school cafeteria, she says that there are so few elective classes now for students to take. Instead of taking journalism class, students have to fill up the day in other ways. “Sometimes students take PE or computer classes twice or even three times in one day. We just can’t afford more teachers to teach the extra classes we need,” said Bridgers. Students have to take foreign language classes online through virtual public schools. “Parents always ask—is this all you got to offer?” in terms of course offerings, Alston said. Field trips used to be more frequent. “I would love to bring my kids to a marine camp, or bring the marine mobile lab here, to my kids.” said chemistry teacher Korman. “But we just don’t have money for that.” Vice Principal Dixon explained that they used to do more field trips, but they are down to just one activity bus now, making the logistics of field trips much more difficult. Teachers can deduct up to $250 of unreimbursed out-of-pocket expenses from their federal taxes each year, but that amount is typically nowhere near what they actually spend in order to stock their classrooms and make sure students have what they need to learn. 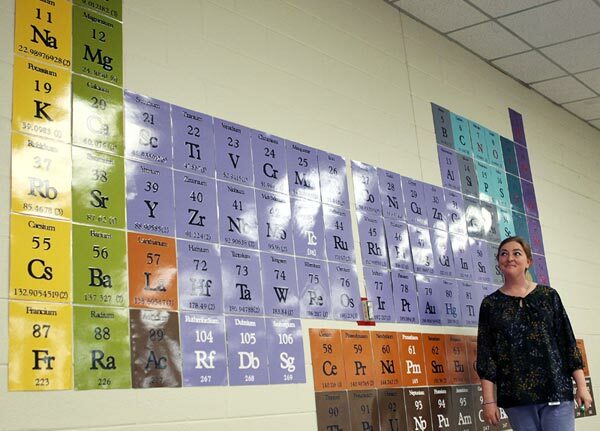 Chemistry teacher Korman says she’s spent “in the thousands” on her classroom, and often resource-intensive subjects like art and science end up costing teachers large sums of cash. “I’m fortunate that my husband has a good-paying job,” says Korman. When asked if she would have been able to take this teaching position if that were not the case, she emphatically said no. Eighth grade language arts teacher Charles Elliott is one half of of a dual teaching career couple. He and his wife moved to North Carolina from Ohio in 2006, in part because at the time, the salaries and step schedules looked promising. “I thought we’d be making a much higher household income by now,” Elliot said. But teacher salaries have been effectively frozen for the past five years, and no one has received their step increases as promised. Recently Elliot’s wife left Franklin County schools for Wake County, where the salaries are generally higher. At the March 2013 meeting of the NC State Board of Education, board members heard a startling report about teacher pay that showed that North Carolina now ranks 46th in the nation in how much teachers are paid. In 2012-13, a teacher with five years of experience has a base pay of $31,220—and that’s roughly $4,000 less than in 2008-09. A teacher must work for 15 years before he or she clears $40,000. Alston explained that he’s been fortunate when it comes to layoffs. “Teaching assistants are very valuable,” says Myra Bridgers. For example, if a teacher has a family emergency and needs to go home, he or she used to be able to rely on a TA to spell him or her for the rest of the day. And the teacher who works with trainable mentally disabled (TMD) children at Bunn, many of whom require special equipment and aids, used to be able to rely on two TAs—she now has just one. The next crucial decision for public school funding will come with Governor McCrory’s budget, expected within the next few days. The fate of funds for remediation programs, technology and teacher pay is ultimately up to the general assembly, where lawmakers will decide this session whether or not to increase funding for North Carolina’s public schools. Dixon said legislators need to spend more time in public schools in order to understand what they need.